Call to action is an important part of well-composed emails and you can guarantee that you are a true marketer if you include it in your email marketing strategies. Call to action has to be a part of your emails. However, there is something more important that you can do with your emails without making it a big deal, and improve your user experience drastically. That strategy is customizing your email signatures; this can become a serious and very notable marketing strategy for your business. It is quite possibile that you already use email signatures to provide a quick overview of your company and your position along with your contact details. However, you can raise the level by using your signature for more marketing campaigns that you use. Email signatures have now become a tool for marketing and branding as well as the lead generation which are available to you readily. You don’t have to run separate promotion campaigns to market your brand. In fact, you can use your promotional message in all your emails that you exchange on daily basis, you can even use promotional banners. Let’s see how email signatures will help in increasing your user experience as well as acting a perfect tool for marketing purposes. You have to make your signature look nicer and of course unique, that’s why we suggest that you use longhand HTML. It’ll help email programs to recognize the effort you are making, and thus they will properly display it. If you are a non-technical person, it is best for you to take help of a tool and build your template. You can do a lot with the right tools. It is a bit technical to start with however when talking about increasing value and user experience, this is definitely going to help you. You have to use the inline CSS along with HTML to make user experience better and more efficient in terms of marketing. You have to make sure to properly customize your tags as standard tags usually don’t work with programs that are used to display an email. You can take help of CSS even if you are not tech savvy, you can, in fact, use an editor that is specially made for email signatures and turn your signature design into code. Yes, it sounds a bit lost, but you have to keep your goal in mind, in the end, you want the perfect signature for your email. You will be lucky if you are familiar with HTML because then you have to just write the right code, but if you don’t, there might be some uncovered gaps. However, if you don’t know any HTML, don’t just go straight to Microsoft tools to make your template because they use their own tools for formatting which wouldn’t look good on all the screens. What you need is the perfect email signature, and that’s why you should use the tool that is built for this purpose. There are tools for every device, but as everybody is quite a fan of Apple products, you will probably require Email Signature for Mac Mail Users. These tools let you choose from hundreds of templates. You can choose one and start editing. It might sound vague, but keep in mind that this is a signature, not a word document, not a web page and not an image on its own. If you know HTML, code it accordingly – avoid some of the pitfalls we’ll detail further on. You are going to use links behind the pictures, which will help promote those links. However, you can use your links and promote them via your email signature. For instance, your contact button can take users to your website contact page, keep the anchor text short and meaningful. It has been predicted that email volumes are expected to rise to billions emails sent on a daily basis. It is thus the perfect time to make your email signatures a great tool for reflecting marketing campaigns and other important operations that you are running. You can simply put the link to your promotion and add a fancy banner at the end of your email and make them a part of your email signature. So, anyone who receives an email from corporate, will be updated about whatever is happening in your company. You can easily use email signatures for promoting your corporate blog. You just have to add the RSS feed to your email signature which is going to display the latest blogs by the company and even automatically update the subscribers as new posts are added. You don’t even have to market your blog when you can easily use email signature for marketing and even increasing your user experience. Promotional banners can be used within your email signature, which ensures that everyone in your company and outside it knows what social or professional activity you are engaged in. It just doesn’t update your status, but will also market the event. You can generate more awareness within your target audience just by adding this banner. 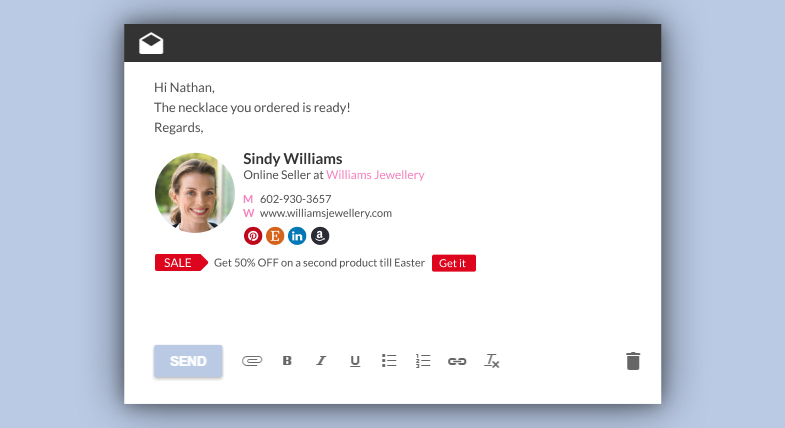 You can even improve the experience of email signatures to reflect on your internal campaigns. For instance, if the company has introduced a new policy for clean desk or if there are vacancies. You can even use a signature to provide tips to your employees. So, email signature can easily be used to handle your internal communications in a subtle manner. Email signatures are very useful if you use them to enhance the user experience and marketing.